Elaine Stritch. Patti LuPone. Anna Kendrick. 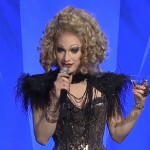 The list of divas who’ve tackled Stephen Sondheim’s Company showstopper “The Ladies Who Lunch” is a fearsome one, and now we can add to it yet another hallowed name: reigning RuPaul’s Drag Race champion Jinkx Monsoon, who performed a lyrically reworked rendition of the Broadway classic at the GLAAD Awards in San Francisco this past Saturday. While the jokey drag lyrics can be lame at best and sacrilegious at worst, Jinkx remains a brilliantly campy yet genuinely gifted live performer. Ms. Monsoon will be returning to SF in October to join Peaches Christ for a celebration of Grey Gardens that is simply not to be missed. In case you haven’t heard, Jinkx has a bit of a Little Edie thing.